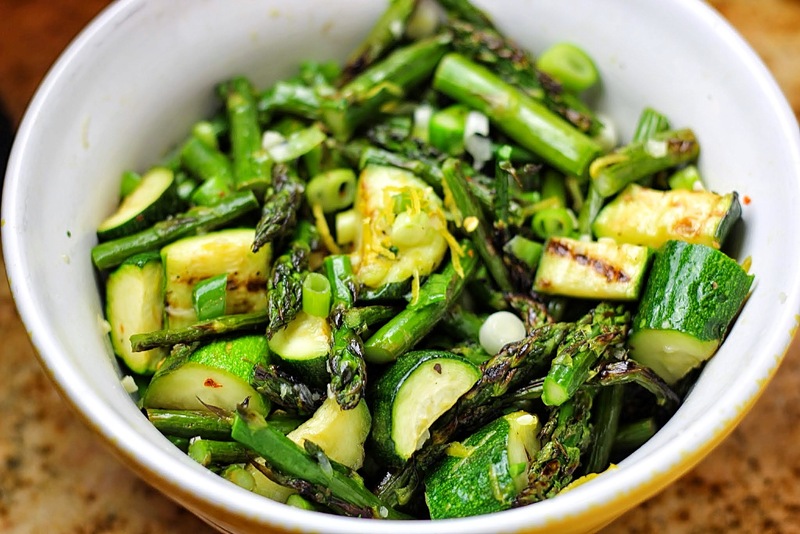 Fresh asparagus and zucchini are grilled to perfection, then tossed in a lemon and basil sauce with tangy garlic, scallions, and red pepper flakes. I love this salad because it is a great way to use extra zucchini and basil, which are both in season right now and growing like crazy in my garden. If you follow me on Instagram (audreysapron) or Twitter (@AudreysApron), you’ve seen my excitement over the success of my first-ever veggie garden. Whether you’re growing zucchini or not, it’s a great time to cook with it because, as I said before, it’s in season, which makes it more affordable to purchase in store. This side dish comes together fast, making it perfect for a weeknight meal. In fact, I made this while we were on vacation. As much as I love cooking, I didn’t want to spend hours in the kitchen on our trip, so I paired this with some grilled chicken. Gotta love summer eats! 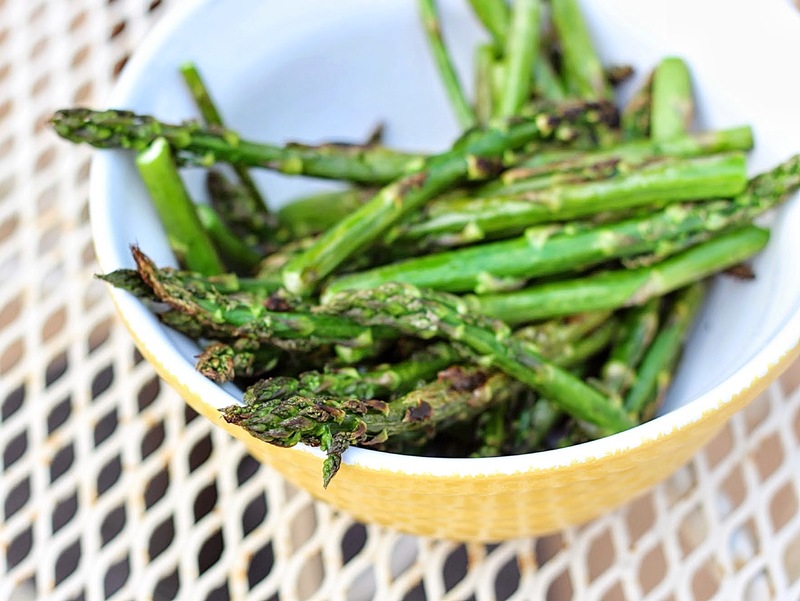 Have you ever grilled asparagus? I love asparagus roasted, but (sadly) I had never thought to grill it until now. If you haven’t tried it, you’re missing out! This is definitely my new favorite way to prepare it. Just as easy as roasting, and just as flavorful (if not more so!). On to the recipe! 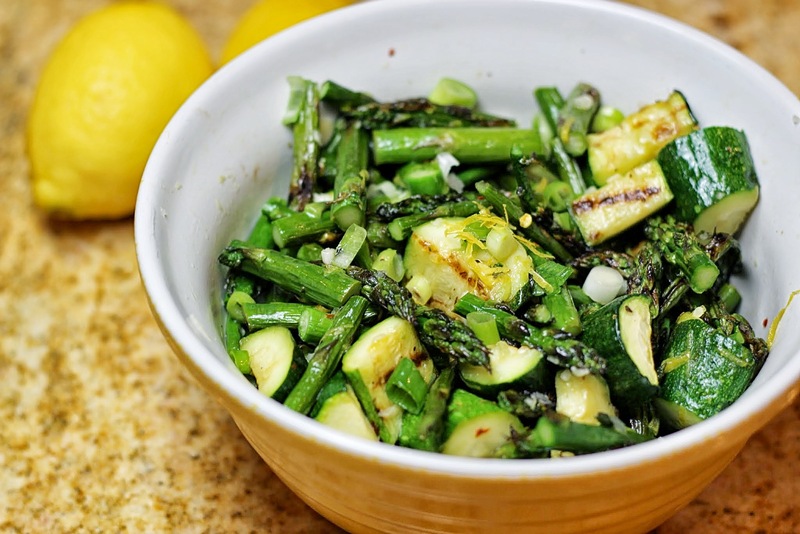 Fire up the grill and toss the zucchini and asparagus in a little oil, salt, and pepper. The zucchini takes longer to cook, so put it on first, followed by the asparagus a few minutes later. While the veggies are cooking, whisk together some lemon juice & zest, olive oil, garlic, fresh basil, scallions, and red pepper flakes. Don’t worry–this dish is not spicy. The red pepper flakes add a tiiiiiny bit of heat, but it’s only 1/4 tsp for the entire bowl, and it’s not very noticeable. In fact, next time I may double that amount. I recommend you taste it and add more if you want it. Basil is one of my favorite herbs, and I think it pairs nicely with the veggies and lemon. If you prefer to use parsley, oregano, mint, whatever… you can do it. You might even want to get adventurous and try a combination. The important thing to remember is to use fresh herbs. Everything about this salad is fresh and light, and I just don’t think dried herbs would have the same effect. If you’re in a bind, you can actually leave the herbs out completely–it’s still very flavorful on its own! 1). Heat the grill to medium-high heat. Prepare the asparagus by trimming the ends. Cut the ends off the zucchini and slice in half. Toss in olive oil and season with salt and pepper. 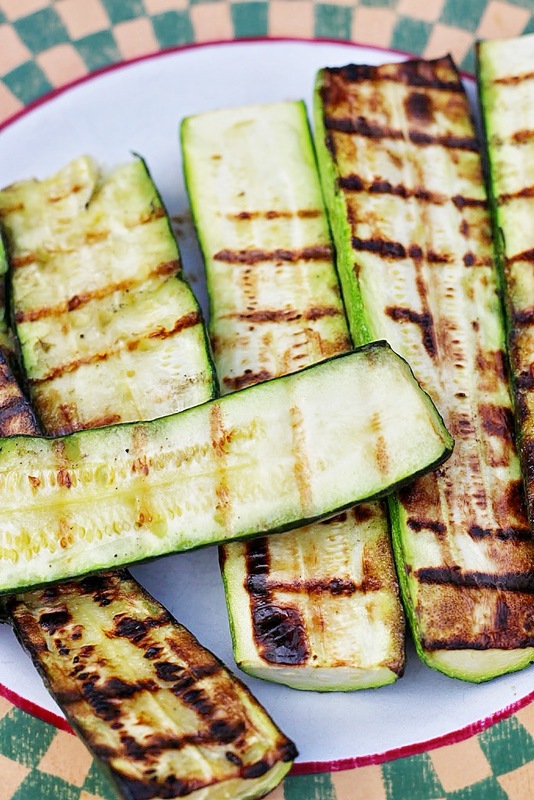 Add the zucchini to the grill, flipping after about 6-7 minutes. Add the asparagus and cook for about 5 minutes per side. The zucchini and asparagus are ready when they are easily pierced with a fork. 2). Meanwhile, prepare the vinaigrette. In a bowl, whisk together the lemon zest/juice, olive oil, basil, garlic, scallions, red pepper flakes, salt, and pepper. 3). When the zucchini and asparagus are fork-tender, remove them from the grill and chop into about 1 inch pieces. Add the chopped veggies to the bowl with the vinaigrette and lightly toss to combine. Taste and re-season, if necessary. Thank you so much! Don’t you just love recipe that are easy like this but still have great flavor? Sometimes simple is best! Audrey this is so simple and perfect for summer entertaining! Impressive! I made this last night and I thought it was awesome! The vinaigrette was perfect. The only thing I will do differently next time (and I should have known better anyway) is to omit the red pepper flakes for the sake of my small children. I personally loved the warmth it gave, but one son got a hold of a flake and began crying for more milk. Other than that minor incident it truly was delicious! I had my four year old pour in the ingredients of the vinaigrette and stir them together for me and he also worked on the entire bunch of asparagus snapping off the ends. It was a great dish to get my kid involved! That’s so great Kara!! I love that you got your kids involved in the kitchen. I’m so happy you enjoyed the dish–and it will still be good without the red pepper flakes next time. Or, if you really want them, you could sprinkle a couple flakes on your portion instead of mixing it in with the rest. Just a thought! Thanks so much for your thorough comment! DIVINE!! And simple, I mean, wow! Just made it for a cookout and everybody was talking about it. Next time, double batch! I’m thrilled you loved it!! Thanks for reporting back! I LOVED this – I didn’t have scallions and it was still great. Had basil 1 night and parsley another and they were both delicious but I’m partial to the basil. So nice for a simple and pretty quick side. Thanks! I added toasted pine nuts for an earthy flavor. It was delicious! Does it have to be served warm? I think it’s best warn or at least at room temperature. You’re back on your blog! Yay!! New cooking inspiration for me. Yessssss! P.S. It’s me, Adriana. I am using my wordpress account where I’m known as traveler64. I don’t like to grill, so I chopped up all of the pieces first and put them in a small pan with EVOO and some water and followed the rest of the recipe as is – DELICIOUS!!!!!!! To all the food bloggers out there. For some mortals we don’t understand the code like cco, ccb, eef, etc. You get the drift. Please speak in plain English. You are not smarter than your reader. Reblogged this on KJensifyme Healthy | Katharine. Can this be made in a broiler?